Whether it's Bone Fishing or deep sea fishing for Mahi-mahi and Tuna, or trawling through the cuts for Snapper and Grouper, fishing in the Exumas is world renowned. Fowl Cay offers the best of both worlds when it comes to dining. You can prepare your own villa meals or simply allow us to wait on you hand and foot. Once used by the local community as an island where they kept their chickens for food – hence the name Fowl Cay – Fowl Cay first became a vacation destination in the 50's when a French couple bought the island and built their home away from home on the spot where the current Lindon Villa stands (again hence the name!). Over the years the island passed through two other families who established their home-away-from-home on Fowl Cay and subsequently enjoyed the beauty of the central Exumas with their families. 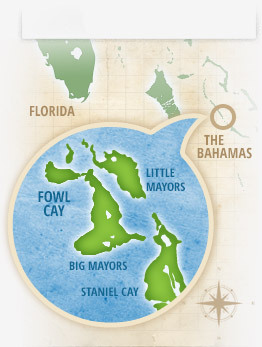 Fowl Cay Resort was established as the first high-end luxury resort in the Exumas in March 2002. 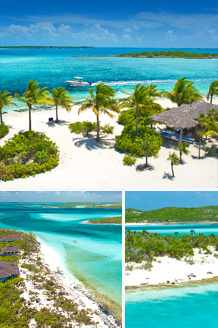 The current owners, The Stewarts, purchased Fowl Cay in 2007 and have been sharing this unique and special getaway with others ever since. Steeped in history, the Exumas was originally home to the native Lucayan Indians until the 1700's when American Revolutionary war Loyalists settled and attempted to establish cotton plantations in the area. To this day, Staniel Cay is one of the few permanent Bahamian Settlements in the entire Exuma Chain and one of the most popular spots for tourists and vacation homes. Local residents are known for their sailing prowess and the Patriarch of Staniel Cay - Rolle Grey, won the first ever National Family Island Regatta on his boat Tida Wave. Even more remarkable, he was at the finish line 50 years later and saw his resurrected boat go on to win the 50th Anniversary of the Regatta in 2004. 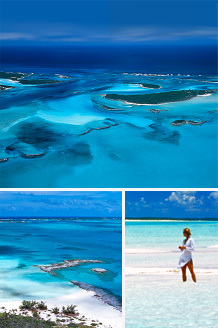 The Exumas is also home to the Exuma Cays Land and Sea Park, the first park of its kind established in the world. It has been designated a No Take Zone in order to protect a safe breeding ground for the marine wildlife and fish that provides the local economy with its jobs and food.